Tonight’s Kaddish is decidedly jaunty as I celebrate the shattering of another glass ceiling: Jill Abramson has been appointed to replace Bill Keller as Executive Editor of the New York Times. The Grey Lady—the newspaper that held out unconscionably long before accepting “Ms” into its lexicon, referring even to Gloria Steinem herself as “Miss”—has for the first time in its 160-year history named a woman to its top editorial post. 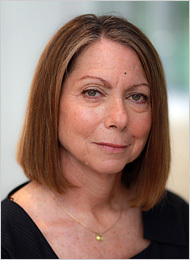 Well, hallelujah, and it’s about damned time, and “Mazel tov!” to Ms Abramson. This entry was posted in kaddish in two-part harmony, podcasts and tagged Bill Keller, Executive Editor, Jill Abramson, Miss, Ms, New York Times. Bookmark the permalink.